FE Ford Engine Performance Tech! Customer preference for the solid roller. Rockers were a Dove race setup - only stuff available for the unique high riser head - which has different pedestal heights and valve spacing. So good old iron HR heads with a solid roller cam. I may be headed this direction. What kind of rocker gear did you use? How were the spring pressures? With a fairly low lift and reasonable rpm, why not a hydraulic roller? Customer preference I'm guessing? Recently completed an engine for a customer that was a bit different than the norm. 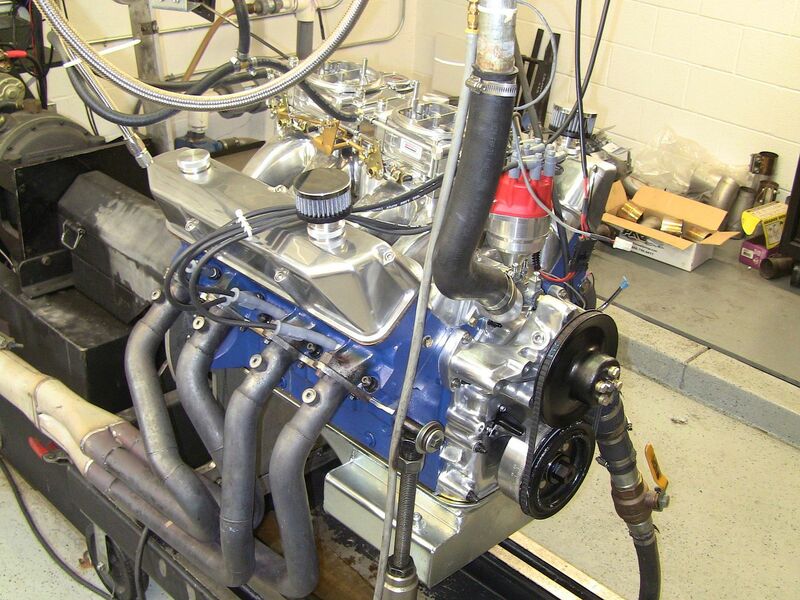 Its a 496 inch Genesis block based piece with a 4.25 stroke. Pump gas deal with compression in the 10s. Neat item was the customer selection of a pair of factory iron 427 high riser heads. Topped by a Dove tunnel wedge and a pair of 750s (actually two pair since we tested some other carbs too...). The heads were in reasonable condition considering their age, but they had been "ported" at some point in their history. While the runners were not that highly altered, the bowls had been opened up to a nearly sharp 90 degree angle on what was the short side radius - pretty messed up by current standards. I was timid (actually scared) to grind too hard on these since I really had no way to know where the iron ended and water began. After kinda rounding off & blending the sharp corner we flowed them and got smooth air to 285 cfm at .600 lift - and them it got really noisy anywhere far beyond that. Using that info - and working against a 600 HP target - we went with a rather aggressive lobe style solid roller that only had .611 gross lift to keep us away from the noisy air. 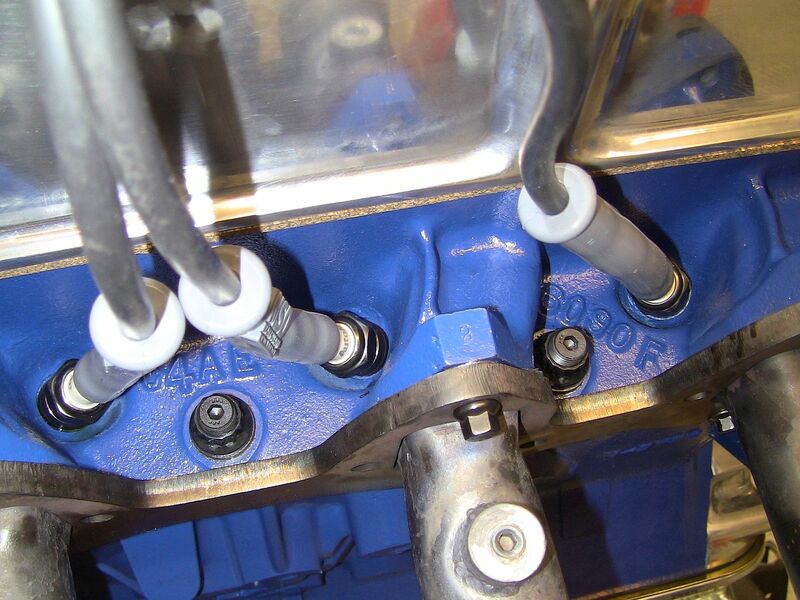 The rest of the engine is comparatively normal - running the Dove high riser rockers system, and a Moroso T pan. Everything aluminum is polished - really pretty package. Took a little while to reel in the fuel curve - it wants a fair amount of left to right stagger jetting to even things out based on O2 readings. Best timing is 36-38 degrees - less than I expected, but it was not too sensitive about that. Tried a different set of carbs and the jetting trend was repeated - so that is definitely a manifold/combination characteristic. Best horsepower ended up at 587 at 6000 RPM. We had a few backup pulls that repeated at 583 in the 5800-6000 ranges. We ran it ran up to a higher 6200-6400 RPM a few times but sounds kinda raspy upstairs & power does not really increase - could be the head limitations doing something since the rocker wear pattern looks fine. 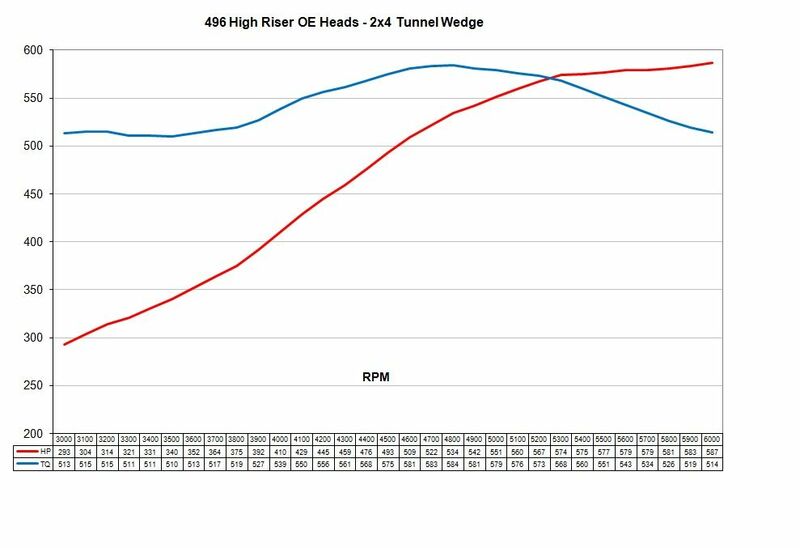 Peak torque came up higher than I expected with a best of 584 pounds at 4800 RPM and a very flat curve - we saw 513 right at 3000. Overall I thought this was pretty cool to see good power from those heads. Reinforces how good Ford's work was back then. It would have been really interesting to see how an unmodified set would perform. We have one customer set here that just arrived with the factory radius valve job still on them. Unfortunately that will need to be reworked but they are still far closer to new and more data will come at some point in the near future.